Last Saturday night, 2 April 2011, I met up with some others who I have met in my journey back along the road I chose not to travel when I first came to the UK in 1991. That road is the one from Winchester to Canterbury that I now know to be The Pilgrim’s Way and, perhaps now even better still, as the road associated with the pubs from Sir Geoffrey Chaucer’s Canterbury Tales. 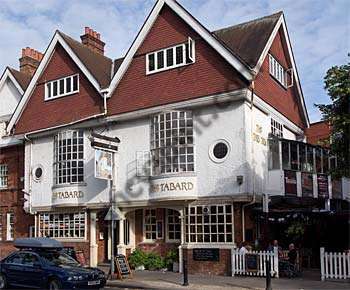 Indeed, to get as close as we could to what relates to the road that’s here nowadays – rather than what is still there from Chaucer’s day – we met at The Tabard, a little pub in Acton named after the pub that Chaucer and his fellow travellers first met at. The first Tabard, set in Southwark, no longer exists – and, in my mind, there are too few pubs in that part of London that really create the atmosphere that might have existed in Chaucer’s day. The Tabard in Acton, by contrast, has a great atmosphere that embraces its local community and is perhaps more true to being a real alehouse than many along the actual road these days. So it was there myself and a few others met to compare stories of how we came to discover this well-worn road – and I realised, by contrast to their stories (which hope to pass on), that mine is probably less interesting due to being such a late and relatively boring discovery from simply reading up on the background of a BBC TV series on it that there was a connection in the book with the places where I first travelled in 1991. Chaucer did not tell a tale, nor describe who he was and what he did himself – yet he did describe each of the tale tellers in detail and titled each of their tales based on what they did. Yet it’s perhaps significant that the tales themselves bear no relation at all to the teller. So hold that thought, for I have a tale on’t from events that unfolded!! It was later that night, after this first gathering of pilgrims and travellers on the road of the Canterbury Tales, that two of us went on afterwards to see what another pub was like in that part of Chiswick. It was the big 6 foot 5 inch, wiry and blonde-haired John, and I, the rather portly and balding 5 foot 7 one, who ventured forth into the bewitching hours of the night as The Tabard wound down its welcome for the evening. To be as honest as possible about it, it was perhaps more akin to Friar Tuck and Little John, out of The Tales of Robin Hood, heading out on the town together – if we are to liken ourselves to anybody and reference classical literature to do it. Anyway, our actual day jobs sound boring by contrast – so let’s NOT let them detract from the tale born of too many White Knights that is to be told here (or perhaps foretold?). Coz, yes, we had both imbibed quite a few real ales earlier at The Tabard – and one in particular called White Knight. I did think about trying a pint of Doom, although – given how I subsequently felt on Sunday after all those White Knights – I’m glad I didn’t. Nevertheless, it was spurred on by those auspiciously named ales that I agreed to let John introduce me to a local Blues bar he likes there in his “manor”, as Brits often call the neighbourhood they live in. Twas there, perhaps spurred on further by a more common real ale by the name of London Pride, that we encountered two damsels in distress due to some overly keen men foisting their attentions on them. Feigning familiarity, we (somehow) fooled the gents into thinking that we were the ones that they had been waiting for – which seemed to do the trick in moving the less likely lads on. Now, bearing in mind the rarity of finding people like I’d just met earlier that evening, I was not really expecting to find anyone likely to know a lot about The Canterbury Tales. Even less so, when we found out that the girls worked as nannies. Nevertheless, they were as curious about us and how we came to know each other and be there – as we seemed to them to be an unlikely pair to be there, given our disparity in sizes. So, not expecting them to know about it, I decided to tell them. To my surprise, one of the girls – whose name is Petra – not only had heard about the tales back home in her native Slovakia but also about a rumour that they parody stories told in Europe by one Boccaccio Dekameron. Moreover, it turns out that she is also interested in these sorts of stories and the experiences that people have along the way. This surprised her friend, as much as it surprised me. Suddenly the cover of Chaucer’s book dropped on me, as well as a curious insight into why he titled his stories so. They tell the tales that can be heard from, as much as appreciated by, Everyman, and perhaps much more than just knightly deeds popular in the court of his day. So clearly Chaucer was very down-to-earth and appreciated others like that too. So it is now clear that, if living by Chaucer’s classification of pilgrims, that there must be a Nanny’s Tale told in the new modern world. To be sure, it will not necessarily be one about changing nappies and chasing children – just as The Miller’s tale did not talk about baking his daily bread nor the Nun’s Priest tale, set on April Fool’s Day, tell about a sermon instead! So perhaps, with now knowing this, I can now move on further on with this quest. Of course, being someone with the last name of Miller, I could be just telling this in jest! This entry was posted in Canterbury, Chaucer. Bookmark the permalink. Thanks, Cindy! The irony is that Chaucer himself, according to The Tales, did not tell his own tale – but merely recounted others. Or did he? That is a moot point in itself, and in the book I have on it there is a theory that he had “reserved” certain tales for other characters – which tends to take the shine off it, for me, in thinking that they weren’t told by actual people he met up and rode with along that road. Certainly the tales I will be retelling will be, as much as possible, from real people – such as yourself – who I meet in travelling back down that road where the shades of my first journey began, perhaps unwittingly, back in 1991 and where the shades of his in 1371 (or thereabouts) cross. One thing though – my (Matt’s) tale does not relate to making a pilgrimage to Canterbury. Indeed, I am struggling with a prologue-style blog to the next tale right now on just who, what, when and where exactly led me to find the TWO roads I found myself on, and perhaps to getting back to one of them. On that note, there is a tale I want to hear in such regards!! Indeed, perhaps at The George Inn next Monday, from a certain granny – who isn’t a granny – and why a handle like that should make a difference as well as whether age makes one any the wiser (and a good tale to go with that). So would you be up for a-telling that, m’lady? P.P.S I think I even met two people whose thoughts, and stories on the day, are not unlike the Oxford Cleric and the Friar. Certainly one of the guys had a pin from Oxford and is seeking to now become a teacher!! How weird is that for a coincidence? Or am I just seeing/hearing things that I want to see/hear?